There is much talk these days about new technologies, and about the talent required to be integrated into future jobs for the implementation and development in such varied fields as big data, artificial intelligence, virtual reality and augmented reality, blockchain or energy itself. In León we enjoy a talent pool of young engineers, with excellent training in the University of León, who lead the young talent at a national level. Proof of this is the success achieved year after year by the ULE students in the EDPR University Challenge, a prestigious initiative connected to renewable energies, promoted by the energy company EDP and running for ten editions now, in which this year one of the projects presented from León has won the second prize. David Borge Diez, professor in the field of electrical engineering in the University of León, and tutor of all the projects presented, tells León UP what the competition process has been like in this 2018 edition. What are the EDPR University Challenge awards? 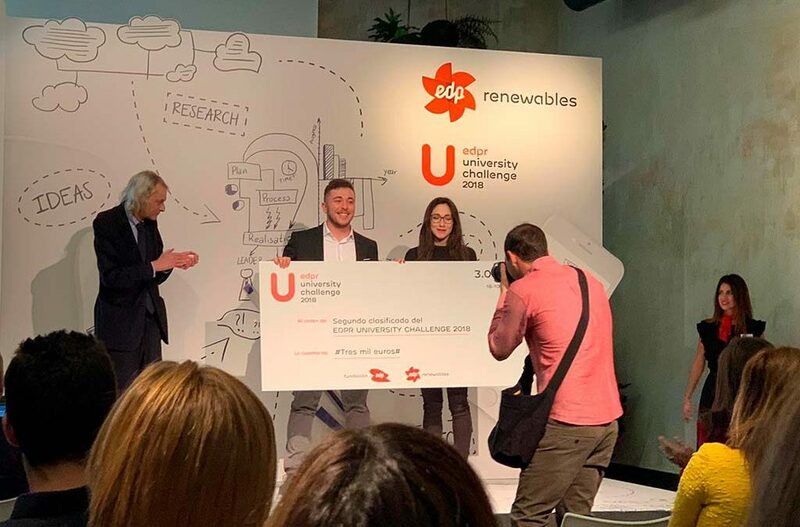 EDPR University Challenge is a competition launched by the company EDP aiming to promote among different student groups the creation of entrepreneurial ideas related to energy and, specifically, renewable energies, which are viable and can improve society and environment. For this, the competition includes a competitive stage where the winners achieve different prizes. The competition permits registration within a team modality of up to 5 people, tutored by a coordinator, the professor, in this case me, David Borge. These students formed a team, just like the rest of participants coming from the University of León, and after registering for the competition there are different stages. To sum up, you need to send an initial proposal and the people responsible for the competition send you back their feedback about it, with the aim of informing you about the adequacy of the proposal as regards the competition topic and providing you with some suggestions to enhance it. Finally, after this process, you must send, within a couple of months, the final project draft for its assessment and, after a few months, the finalists are revealed, in this case 15 among over 700 teams. The finalists need to attend a specific event that was held in Madrid on 19th October, where they had to defend their project, firstly with a brief two-minute presentation in which their synthesis ability is assessed, and secondly, with a more extensive five-minute presentation, after which the three award-winning projects are selected. Who represented the University of León? In my case, 7 teams participated in the competition, two of which reached the final stage, a proof of the high level of the University of Léon in this field. One of these two finalist projects, Efficerey, won the second prize. What are the finalist projects like? Tell us briefly about each of them. The first of them is called Efficery, and it consists of an application designed to help users seeking to achieve greater day-to-day energy efficiency and saving. It is an easy-to-use smartphone application which has a two-fold objective: to encourage the user to save energy and improve its energy efficiency. It also provides a guide with practical and real-life tips to achieve the goal; for example, systems to reduce the consumption of light, using LED technology, and, moreover, if the user meets specific saving goals, he/she will obtain discounts and financial aid to be able to afford these systems and implement them in their household, business or company. The application aims to encourage saving, but in a straightforward way for the user, without needing to have advanced technical knowledge and always adapting to its type of use. The second of them is a project to promote Sustainable Mobility in natural spaces, particularly in National Parks, although the model is valid for any protected space. The project consists of a plan to implement a sustainable transportation system causing as little impact as possible at all levels, both in Spain’s national parks and in other protected spaces. The project presents a solution to integrate the electrical mobility into natural spaces, thus reducing pollution, noise and other effects harming the ecosystem, not to mention the damage on tourism and the annoyance for their inhabitants. For this reason, it intends to launch an integral solution both for the transportation of people and goods using electrical vehicles. Furthermore, a system of recharging points which use renewable energies has been designed, so you don’t need to have access to the electrical network and greenhouse gas emissions are reduced, as well as pollution in general. What would you highlight regarding talent in the University of León? I would highlight the ability of students, professors and researchers to compete with other national and international universities, at the highest level possible, many of which have greater resources. The professors, researchers, students and graduates show, on a daily basis, in my experience, that they are absolute top-class talent. We would like to thank David for his effort and work in the area, which undoubtedly yields results, and congratulations to all the students of the ULE for presenting projects of such a high quality, which is proof of the team of talented engineers existing in our city. If you wish to know more details about this or other projects taking place in the city of León, please contact León UP by calling on 987 875 875, send us an email to leonup@ildefe.es or fill out the form below.